I’ve shared serious articles on gun control, featuring scholars such as John Lott and David Kopel. I also posted testimonials from gun experts and an honest liberal. But I haven’t specifically criticized Obama’s agenda. 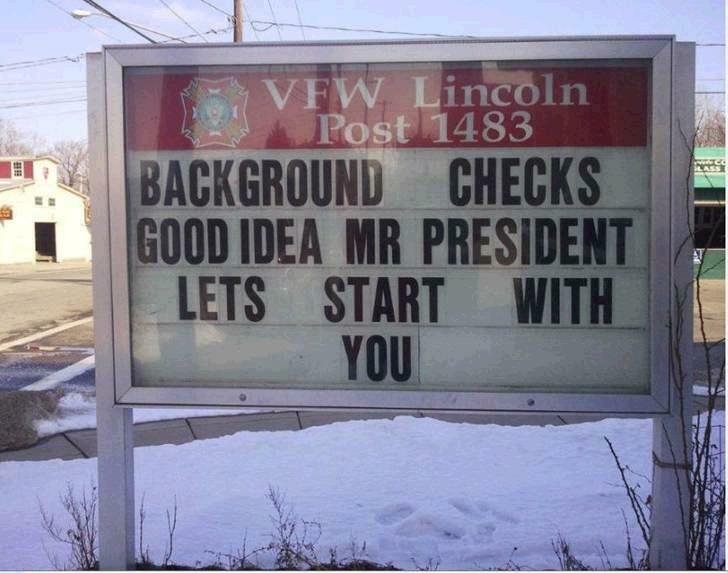 And I’ve shared lots of gun control humor, such as this IQ test that I posted for liberals and criminals, this very effective neighborhood watch group, and several amusing videos linked at the end of this post. I’ve also shared clever pro-Second Amendment posters here, here, here, here, here, and here, and some amusing images of t-shirts and bumper stickers on gun control here, here, here, and here. But with the possible exception of this poster, none of this humor has focused on Obama. So let’s rectify this oversight, starting with the VFW sign that appeared in my inbox yesterday. Looks real, though I make no guarantees about its provenance. 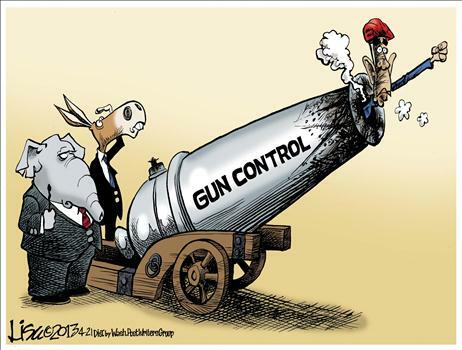 Then we have a very good Lisa Benson cartoon celebrating President Obama’s legislative acumen on gun control. By the way, my all-time favorite gun joke is the one explaining the difference between liberals, conservatives, and Texans. Though the Alabama tan definitely gets honorable mention for obvious reasons. Gotta love that Alabama tan!